STG MiniModules | CSM Products, Inc. 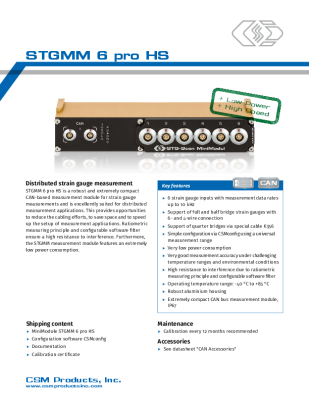 The very low power consumption, an extremely compact size, high measurement accuracy even under extreme temperature conditions and the simple configuration make the STGMM 6 pro HS perfectly suited for a variety of distributed measurement tasks with strain gauges. Realisation of quarter-bridge circuits via external quarter bridge completion in the connection cable in conjunction with TEDS and thus extremely precise measurements due to the proximity of the bridge completion element to the point of measurement.